Distinguished Daughters of Pennsylvania began in 1948 to honor women who have shown distinguished service through a professional career and/or voluntary service. The women are nominated to receive the honor by non-profit organizations within Pennsylvania. They do not need to be natives of Pennsylvania, but must have lived in the commonwealth at some point. Edith Bell has been working for peace and social justice for 60 years. She is a long-time member of the Women’s International League for Peace and Freedom and works with the Thomas Merton Center. She co-founded the Pittsburgh Raging Grannies. Born in Hamburg, Germany, she survived concentration camps, lived in Israel after the war and in Panama, where she met her future husband Sidney Bell. Bell has a daughter in Pittsburgh and a son in Rochester, NY with families who are all supportive of her work. She continues her work, because “Evil can only happen, when enough good people stand idly by and do nothing”. Siobhan Reardon is president and director of the Free Library of Philadelphia. Through her leadership, the reimagining of the Free Library of the future is highlighted via the Library’s “Building Inspiration” campaign marking the physical and programmatic changes necessary to present a viable 21st Century library organization. Notable programmatic enhancements include the establishment of the Culinary Literacy Center, the Center for Public Engagement and the Business Resource and Innovation Center which supports the development and advancement of small businesses and entrepreneurs. Reardon holds a B.A. from SUNY Purchase (NY), an M.A. from Fordham University, and an M.L.S. from the Palmer School of Library Science at Long Island University. 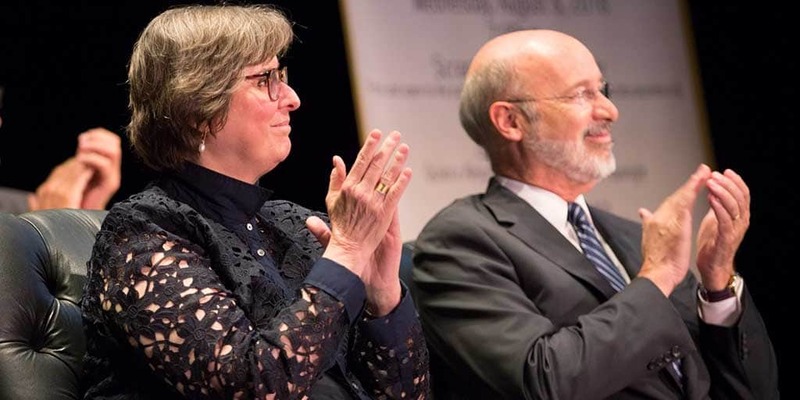 She serves on a number of boards in Philadelphia and nationally and was named Library Journal’s Librarian of the Year in 2015. Dr. Carol Shields was trained in ophthalmology at Wills Eye Hospital in Philadelphia and completed fellowship training in ocular oncology and ophthalmic pathology. She is currently Director of the Oncology Service, Wills Eye Hospital, and Professor of Ophthalmology at Thomas Jefferson University in Philadelphia. Each year the Oncology Service manages approximately 500 patients with uveal melanoma, 120 patients with retinoblastoma, and hundreds of other tumors. Dr. Shields has co-authored 9 textbooks and over 1600 published scientific reports. She takes special interest in the management of retinoblastoma, uveal melanoma, conjunctival malignancies and many other intraocular, conjunctival, and orbital tumors. A pioneer in the executive search industry, Judith M. von Seldeneck is the founder and chair of Diversified Search. After working as an executive assistant to then-Senator Walter F. Mondale in Washington, D.C., in 1974 she founded what would become Diversified Search, and over time built the firm into a powerhouse placing C-Suite talent. In 2018, Diversified, which has nine offices throughout the U.S., was ranked fifth by Forbes magazine in its list of the Top 250 search firms in the nation. The recipient of numerous professional awards — including the William Penn Award, Philadelphia’s highest civic honor — von Seldeneck has been active on many public, private, and not-for-profit boards, and co-founded the Forum of Executive Women, the largest association of women business leaders in Philadelphia. Author, activist and entrepreneur, Judy Wicks founded Philadelphia’s iconic White Dog Cafe in 1983, which became a pioneer in the local food movement and a model in sustainable business practices. She is founder of Fair Food Philly (2000) and the Sustainable Business Network of Greater Philadelphia (2001) and cofounder of the nationwide Business Alliance for Local Living Economies – BALLE (2001). Wicks’ memoir Good Morning, Beautiful Business won a national gold medal for business leadership and has been translated into Chinese and Korean. Her work has earned numerous local and national awards, including the James Beard Foundation Humanitarian of the Year Award, the International Association of Culinary Professionals Humanitarian Award and the Women Chefs and Restaurateurs Lifetime Achievement Award. Wicks was inducted into the University Science Center’s Innovators Walk of Fame in 2016.